1. 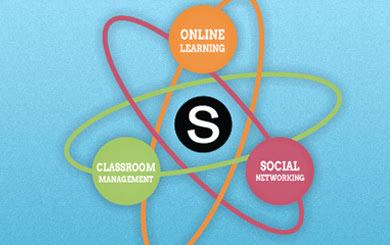 Schoology's classroom management suite offers all of the tools that a teacher would use to support a connected online learning environment. Attendance, grade book (traditional & standards-based), online posting of assignments and assessments. Teachers can create online quizzes & tests. This practice can provide instant feedback to the students, and differentiation opportunities for teachers. One distinct advantage that Schoology offers over many other LMS products is the ability for faculty and students to have a complete and reciprocal document workflow from within the application. 2. 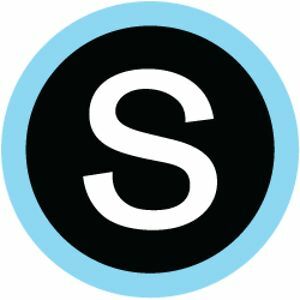 Schoology provides curricular RESOURCES and collaborative GROUPS for students and teachers to build and engage with their personal learning networks. Course-specific or public resources (lesson plans, assessments, rubrics, etc.) are available for teachers to use and share. There are also many educationally-based social networks (groups) supported through Schoology. Examples include; 1 to 1 Computing, Common Core, Flipped Classrooms, and Response to Intervention. Teachers and students can also create their own social groups that can establish either a private or public communication forum. 3. Schoology will run on any web browser - although, Chrome seems to provide me the best combination of speed and clarity. There are also Schoology mobile apps for Android and iOS. The mobile app features are limited in comparison to the web app, but the developers at Schoology are hard at work to make the mobile apps as feature-rich as their web experience. Any device, any browser capability makes Schoology ideal for a 1:1 BYOD implementation. 4. Schoology API (application programming interface) means that other applications can connect and interact with the Schoology program. Google Drive, Twitter, and Facebook are prime examples. If you already have an established LMS, Blackboard and Moodle data can be exported to Schoology. Schoology has partnered with several application companies to provide a more comprehensive, one-stop-shop, learning destination. Remind, Turnitin, and NearPod are popular in our learning circles. Schoology's partnerships are continuing to grow as new features, and enhancements get introduced and implemented. 5. Finally, Schoology's instructional components are FREE to teachers, students, and parents. (An Enterprise version allows for additional school management, developer, and analytic tools.) Teachers can create a code for parents to follow along with the course, as well as, monitor the progress of their son or daughter. Nearly all of our high school students are familiar with Facebook. This makes Schoology attractive and easy for them to navigate and learn. Also, almost all of our teachers were able to create an account, build a course, collect a few resources, join a group or two, and begin posting online course materials within their first hour of professional development training. Students appreciate being able to access class materials from anywhere and at any time. Administrators have found Schoology to be a terrific organizational, communication, and management tool for faculty and staff. 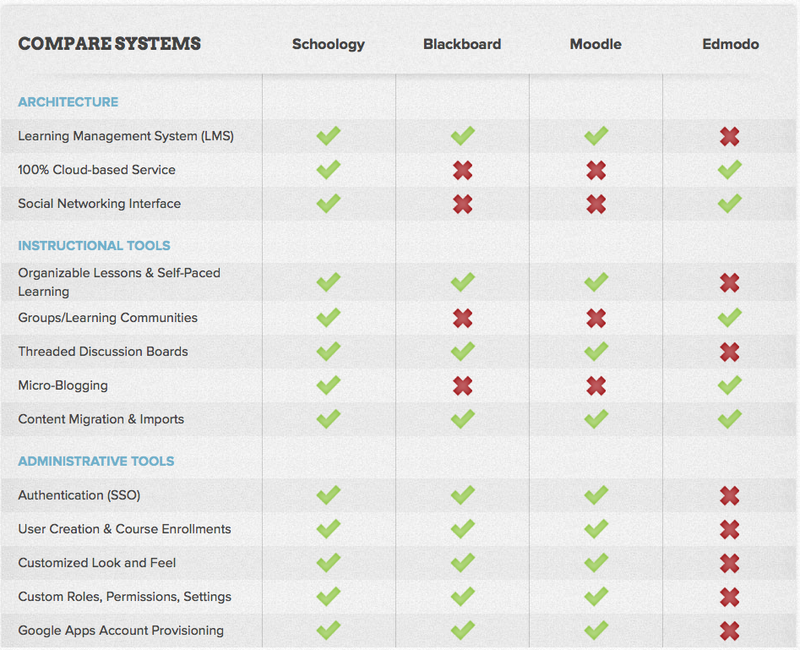 Schoology has been rated in the top ten of educational APIs (Noodle Education / Edudemic). They are a growing company that is big enough to be influential, but still small enough to respond to individual teacher and student requests. They are actively seeking feedback and advice from educators to help grow and improve their product. If you are looking to adopt a learning management system, you would be hard-pressed to find a connected learning product better than Schoology.